I remember one year it was my dad’s birthday and we were having a hard time trying to come up with a cake theme for him. I mean, he’s had a lot of birthdays and we felt we exasperated all of his likes on previous ones. For days, my mom and I pondered about what sort of cake to create for my dad. Finally, we decided to make him a carrot cake, shaped and decorated like one because carrots were his favorite snack. I was beyond excited to make this cake because just like my dad—I love carrots especially in a cake form! I still remember that cake like it was yesterday… That decadent cream cheese frosting… Those little pieces of carrot… that extremely soft cake… Thinking about this cake makes me want some right this second. 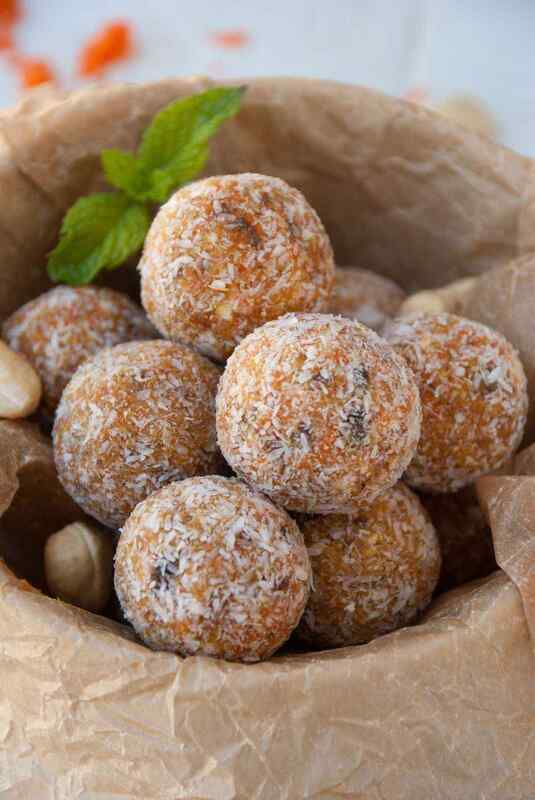 And that’s exactly what happen earlier today when I made these extremely delicious and super healthy carrot cake energy bites. These little babies might not be the carrot cake I made when I was a child but they are just as scrumptious and not to mention much healthier than traditional carrot cake. Also, much easier to eat on the go. No fork needed for these little bites. 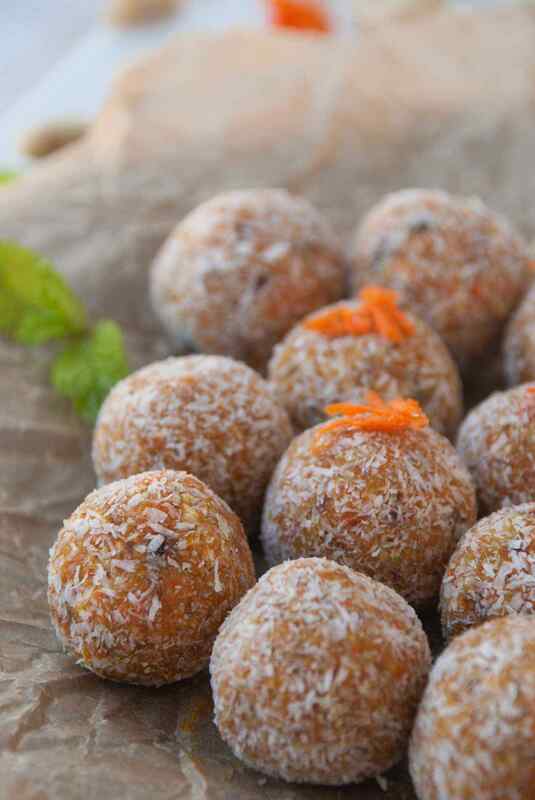 The best part about this recipe is that with just a few simple pulses of the food processor you too can have these delightful carrot cake balls in just a few minutes. Ah, my childhood rolled into a bunch of tiny energy balls. 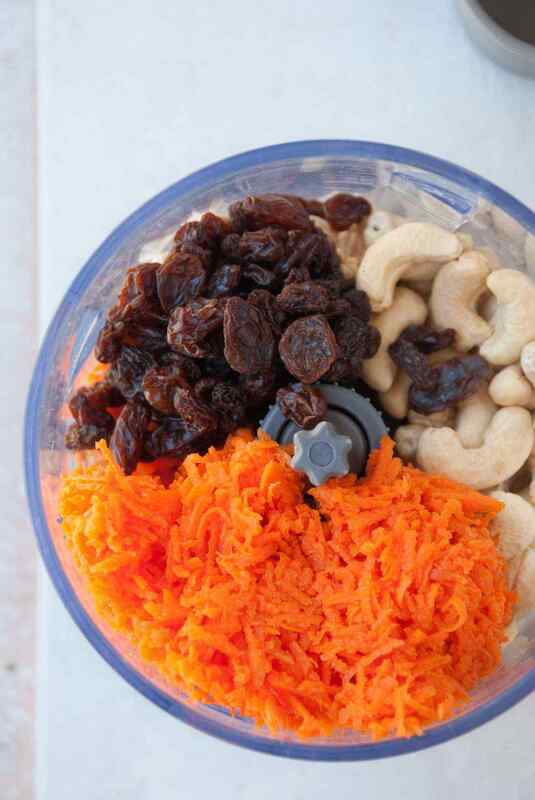 I brought my father some of these energy bites and he was quite impressed that I not only remembered his love for carrots but also that something so healthy could taste so delicious. I blame the deliciousness on the carrot-date combo but I’ll take credit for the excellent memory.